Today's top nuclear policy stories, with excerpts in bullet form. Israel has until the weekend to launch a military strike on Iran's first nuclear plant before the humanitarian risk of an attack becomes too great, former U.S. Ambassador to the United Nations John Bolton said Tuesday. A Russian company is expected to help Iran start loading nuclear fuel into its plant on Saturday, after which an attack on the Bushehr reactor could trigger harmful radiation, which Israel wants to avoid, Bolton said. Michael Oren, Israel's ambassador to the United States, told Fox News that Israel is "committed" to the sanctions program [against Iran] and will assess its impact at a later date. Bolton expressed doubt that Israel was planning a military strike but suggested it's an open question. The reactor project has been in existence for decades, but the Russians have helped push it to the finish line. According to the Iranian state Mehr news agency, the head of [Russian state firm Rosatom], Sergey Novikov, says the plant "just generates electricity." Jeffery Goldberg's cover story in The Atlantic Magazine saying that Israel is likely to bomb Iran within a year is no simple propaganda exercise. Indeed, what’s striking is that, for all the space given to the views of hawkish Israeli officials, they don’t wind up looking very good, and neither does their case for bombing Iran. My own sources tell me that, though many Israelis take seriously this prospect of Iran trying to annihilate them, Israel’s policy elites by and large don’t. They realize that Iranian leaders aren’t suicidal and so wouldn’t launch a nuclear strike against a country with at least 100 nukes. In any event, his article shouldn’t distract Americans from the real question: Given that the United States would almost certainly be drawn into war with Iran in the wake of an Israeli strike, and given that America would be blamed for the strike whether or not it had green-lighted it, and given the many ways this would be bad for national security, how can American leaders keep it from happening? Goldberg's article, read closely, suggests that even from Israel’s point of view, there’s no sound rationale for bombing Iran, especially when you consider the long-term downside: an attack would radically dim what prospects there are for lasting peace in the Middle East; Israel’s downward spiral — in which regional hostility toward it leads to conflicts that only deepen the hostility — would be sustained big time. If appealing to America’s interests isn’t enough to keep Israel from attacking Iran, maybe appealing to Israel’s interests will help. John Bolton says that Israel has only a few days to bomb the reactor near Bushehr, Iran, because the fuel rods are scheduled to be inserted soon, and once they are the reactor cannot be bombed without irradiating civilians. A glance around the web suggests that his remarks are being widely misread. The Bushehr reactor is a light-water reactor, which makes it a less urgent threat than other pieces of Iran's nuclear program. Arms control negotiators love light-water reactors, because extracting weapons-grade material from a light-water reactor is difficult, expensive, and impossible to do in secret. The Bushehr reactor isn't necessarily a primary target because it is not a primary threat. So while it's true that the Israelis have lost the opportunity to bomb Bushehr without spreading radiation, it was never a very important opportunity. When the U.S. Senate returns from its summer break next month, it can take an important step to increase the security of the United States and the world by ratifying the new START treaty. It is important to remember that as long as the Senate lets the new START treaty languish, there is no formal mechanism to keep tabs on Russia’s nuclear activity. The agreement, which needs 67 votes for ratification by the Senate, has gotten tangled up in partisan politics, posturing and pork barrel negotiations. There is also a group of senators who are opposing the bill in an attempt to get more money for nuclear weapons labs in their states. If the world’s two largest nuclear powers can’t agree on weapons limits, what credibility do they have when they ask other countries to limit, or forgo, such weapons? The treaty is supported by former Secretary of Defense William Cohen, former Secretary of State Colin Powell and many other top military and diplomatic leaders. It should be supported by the U.S. Senate, too. Israel's long-anticipated attack on Iran's nuclear program may come as soon as Friday. We're now down to two days and counting. Action is needed. In February, the International Atomic Energy Agency (IAEA) reported for the first time "concerns about the possible existence in Iran of past or current undisclosed activities related to the development of a nuclear payload for a missile." The strike needn't happen before Friday. 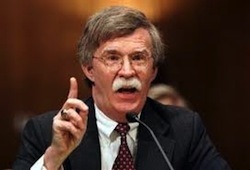 Mr. Bolton set that deadline because he was concerned that destroying an operational plant would create a radiation hazard, but a strike that left the site radioactive would hinder Iranian attempts to get it back up and running. Russia, Iran's nuclear sponsor, is likely to voice strong objections; the usual anti-Israel suspects will howl; and the United States may not be as sturdy a champion for Israel as it was in the past. But the time has come to demonstrate resolve in face of an imminent threat from Iran. The Free World depends on Israeli power.